Early diagnosis of cataracts can help you maintain clear vision until the condition reaches advanced stages. 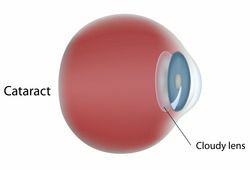 While surgery is the only permanent means of treating cataracts, it is usually not necessary in the early stages. Dr. Sonny Goel offers comprehensive cataracts testing to provide a diagnosis and recommend conservative measures such as prescription eyewear, ample lighting, and certain lifestyle changes. If you are experiencing cataract symptoms and would like to learn more about Dr. Goel's process of diagnosing cataracts at his Annapolis, MD, ophthalmology practice, contact us and schedule a consultation. If you notice any changes in your vision, it is important to schedule an appointment with your eye doctor as soon as possible. During your visit, Dr. Goel will take all the time necessary to analyze your symptoms, make an accurate diagnosis, and determine a plan of action. Visual Acuity Test - Dr. Goel will ask you to read a series of letters on an eye chart using one eye at a time, while your other eye is covered. By testing your visual acuity, Dr. Goel can determine if a cataract may be compromising your vision quality. Slit Lamp Analysis - A slit lamp allows Dr. Goel to analyze your cornea, iris, and crystalline lens by using an intense light and magnifying lens. Dilated Eye Exam - Dr. Goel can administer special eye drops that cause your pupils to dilate. Next, he will use an optical lens to carefully examine your eyes. Tonometry - A tonometry test assesses intraocular pressure, or the pressure inside the eye. These tests allow Dr. Goel to gain a comprehensive understanding of your ocular health. As part of our commitment to patient education, we will guide you through each step of the process so you can understand the purpose of each test. If you are experiencing cataract symptoms, or if you are simply interested in scheduling an eye exam, contact our practice today. If cataracts are detected, we will monitor their progress in order to determine which treatment option is best. Eventually, laser cataract surgery will become necessary, but we can recommend conservative measures to help you maintain your vision until your cataracts reach advanced stages. Your vision is a precious asset, and you can depend on us to provide accurate diagnoses and effective treatment plans.